According to the Wall Street Journal, RIM had considered but eventually rejected plans to license BlackBerry Messenger to handset competitors. BBM is an encrypted, proprietary, Internet-based messaging service that serves as an advanced substitute to the traditional SMS messaging offered by most phones. 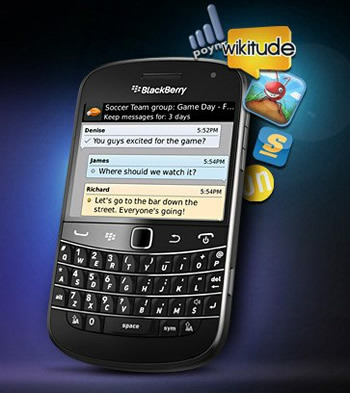 The plan, known internally as "SMS 2.0", was scrapped due to concerns that giving competitors access to BBM would diminish interest in BlackBerry OS. BBM is possibly the one RIM property that has maintained wide appeal, increasing from 5.3 million to 55 million users since 2009. That surprising rise in BBM users is in spite of a continued, precipitous drop in market share for BlackBerry handsets from 50 percent of the market to less than 10 percent by recent IDC estimates. Bloomberg also brings us news that RIM has shed yet another high-level executive. Patrick Spence, head of global sales, has decided to switch industries after 14 years of service with RIM. This marks the latest of several executive departures. Both the VP of BlackBerry Messenger and Blackberry's senior VP took flight in April while co-CEOs, Mike Lazaridis and Jim Basillie, also stepped down in January. Although Lazaridis and Basillie continue to sit on RIM's board, their exit from center stage was intended to revitalize investor confidence and reinvigorate the once seemingly indomitable handset maker. Additionally, RIM had also recently hired new chief marketing and chief operating officers. RIM has continued to languish in a market which became dominated by Android and Apple handsets seemingly overnight, but it hasn't given up yet. The smartphone maker is expecting BlackBerry OS 10 and an array of new handsets to provide the jolt it needs to maintain relevancy in an increasingly crowded industry.